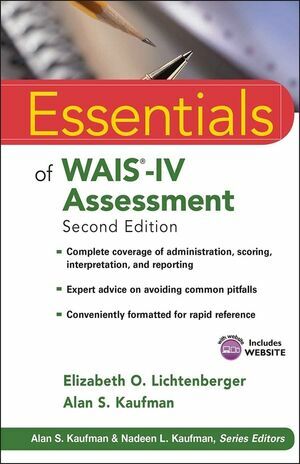 Coauthored by Alan S. Kaufman, who was mentored by David Wechslerthe creator of the Wechsler scalesEssentials of WAIS®-IV Assessment, Second Edition is thoroughly revised and updated to provide beginning and seasoned clinicians with comprehensive step-by-step guidelines for effective use of the WAIS®-IV. This invaluable guide provides clinicians with a brand new interpretive process, overhauling its system of profile interpretation to be equally powerful across the entire WAIS®-IV age range. The new edition explores timely topics including gender and ethnic differences, as well as the role of the Flynn Effect in capital punishment court cases. Along with an accompanying CD-ROM containing scoring tables and case report material, the Second Edition includes information and advice on how to administer Q-interactivethe new digital version of the testfor administration of the WAIS®-IV via iPad®. ELIZABETH O. LICHTENBERGER, PhD, is a licensed clinical psychologist residing in Carlsbad, California. She has coauthored several Essentials books, including Essentials of Assessment Report Writing (with Nancy Mather, Nadeen Kaufman, and Alan Kaufman). She and Alan Kaufman are coauthors of Assessing Adolescent and Adult Intelligence, now in its third edition. ALAN S. KAUFMAN, PhD, a leading expert on intelligence testing, is Clinical Professor of Psychology at the Child Study Center at the Yale University School of Medicine. His books, tests, and intelligent testing approach have had worldwide impact on clinical assessment. Dr. Kaufman's approach to test interpretation and his testssuch as KABC-II and KTEA-II, which he co-created with Nadeen Kaufmanreflect an integration of psychometric, theoretical, and clinical perspectives. Alan and Nadeen are the Series Editors of Wiley's Essentials of Psychological Assessment series.